We have been enjoying a stunning summer in Ireland this year, but even in bad weather (any season), beaches are terrific amenities. Our properties based near the sea, are also based in counties with some pretty special and unspoiled beaches. County Wicklow’s best known beach is Brittas Bay, with miles of soft, golden sand. Less well known, but near to Brittas Bay is gorgeous Magheramore. Silver Strand is very close to Wicklow Head Lighthouse and is a little gem of a beach. Set out on the wild Galley Head in County Cork, near to the town of Clonakilty, our houses are very close to Red Strand with its golden sand and exciting waves. Inchadoney Strand is a short drive away. For any surfers, the waves are pretty spectacular and there is also a surf school. The county of Cork has some gorgeous beaches including Barley Cove out near Mizen Head, the most south-westerly point of Ireland. Located on the tip of the headland, this County Clare property is close to the well known Spanish Point beach and Milltown Malbay’s White Strand and Kerin’s Hole – very Enid Blyton! 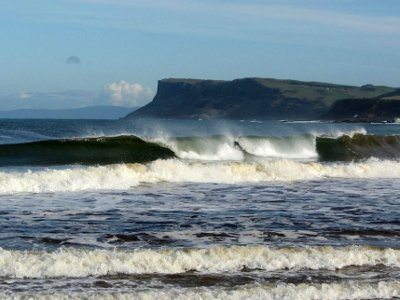 County Sligo is a very popular county for beaches and draws lots of surfers, especially to Strand Hill. There are fabulous Voya seaweed baths here if you don’t want to surf. Rosses Point and Mullaghmore are two other lovely, golden, sandy beaches. Ballymastocker beach in County Donegal’s Fanad Peninsula was voted one of the most beautiful beaches in the world and Tullagh Bay on the Inishowen Peninsula is a special find. The county is literally teeming with stunning beaches for all sorts of water sports or quiet relaxation. We have six properties in County Antrim including our stunning new Old Corn Mill. Near Magherintemple Lodge is Ballycastle beach and Fair Head. 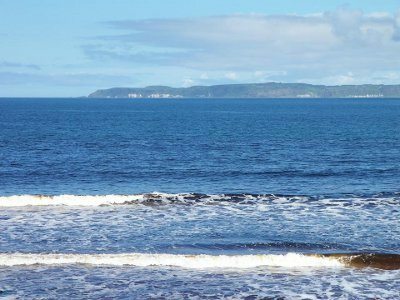 From the beautiful Antrim coastline there are views of Rathlin Island and even Scotland on a clear day. As always, these are only a couple of suggestions and not at all an exhaustive list. Oh we do like to be beside the seaside. Happy exploring!